The 5SV Reverse Osmosis System was one of the first systems on the market and yet today it still provides great quality drinking water. This system installs under your sink with a 3 gallon storage tank which will provide you with enough water for your daily use. Changing the filters is as simple as: removing the filter housings by unscrewing the filter bowls, dropping in your new filters, and then screwing back on the filter housings. 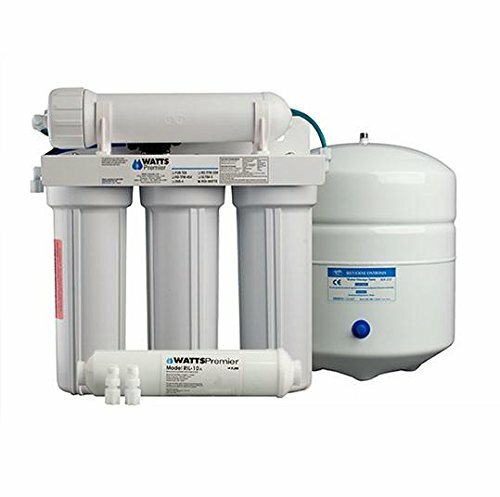 The 5SV Reverse Osmosis Filtration System uses a 4-Stage Filtration based upon separate treatments. Sediment - A 5 Micron Sediment Filter traps sediment and other particles like dirt, silt and rust which affect the taste and appearance of your water. Carbon - Two 5 Micron Carbon Block Filter reducing Chlorine, Chloramines and other materials that cause bad taste and odor. 50 GPD Membrane - A Semipermeable Membrane removes TDS, Sodium and a wide range of contaminants such as Chromium, Arsenic, Copper, Lead as well as Cysts, such as Giardia and Cryptosporidium. Carbon In-Line (GAC) - A high quality In-Line Granular Activated Carbon (GAC) Final Polishing Filter is used after the water storage tank to remove any remaining chlorine or other chemicals that cause bad taste or odor before being dispensed.